News now from James Bland at Fraser Yachts of a second price cut this month, one of €350,000, on the 27.25m motor yacht Nida, a joint listing with Kristofer Westermark at Ventura Yachts. Built by Posillipo to RINA class in 2009, Nida accommodates eight guests in a full beam master suite, VIP stateroom and two twin cabins while her twin 2400hp MTU engines have logged only 450 hours since new. 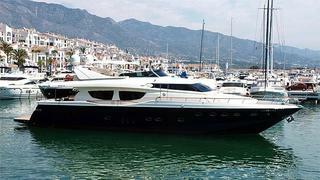 Lying in Puerto Banus, Nida is down from €2.6 million to €2.25 million.